Successfully Added Smart Bluetooth V3.0 Bracelet Watch - For Android Phones, OLED Touch Screen, SMS/Phonebook Sync, Make/Answer Calls, Pedometer to your Shopping Cart. 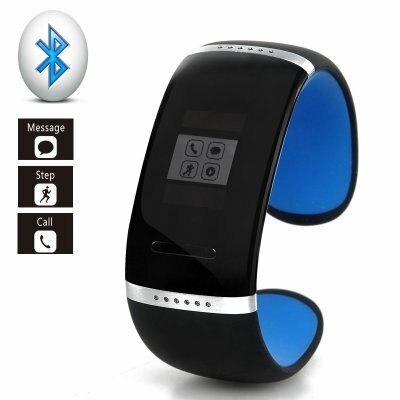 Smart Bluetooth V3.0 Bracelet Watch designed to work with Android Phones has an OLED Touch Screen, and can SMS/Phonebook Sync as well as Make/Answer Calls plus operate as a Pedometer. This Bluetooth bracelet has been specifically designed to work with Android smartphones, making it even more practical to use when on the go. When you receive a call then there will be no need to look through your pockets, purse or bag when you are wearing this bracelet as it syncs to your phonebook and also allows you to receive and answer calls. It sync using Bluetooth version 3.0 for a more stable, efficient and stronger connection, plus it can support a longer distance than previous versions. It has a built-in battery and can be recharged using the accompanying cable for micro USB universal standard. Other functions include a pedometer to help count each step a person takes by detecting the motion of the person's hips, so it is great to see how far you have walked. Also the gorgeous OLED touch screen is great for navigating through the menus and as well the overall operation of the smart bracelet. The complete design of this smart bracelet is stunning and will look suitable when worn with any attire. The App is on the CD.